Shannon O’Neill is an artist and founder of Alias Frequencies (http://aliasfrequencies.org). He lectures in Media Arts at the University of Technology, Sydney. TAKING THE OPPORTUNITY FOR CHANGE AND RENEWAL, THE ORGANISERS OF THE 2008 NOW NOW FESTIVAL CHOSE TO MOVE THE EVENT FROM “THE POLLUTED, CONFINED SPACES OF SYDNEY’S EXPERIMENTAL MUSIC GHETTOES”, AS THE ANNOUNCEMENT PUT IT, AND “TAKE A DEEP BREATH AND RELOCATE TO WENTWORTH FALLS IN THE BLUE MOUNTAINS.” THIS WASN’T ENTIRELY SURPRISING GIVEN THAT THE AREA IS HOME TO MANY ARTISTS AND MUSICIANS, INCLUDING SEVERAL NOW NOW REGULARS. The NOW now festival began in 2002 as the brainchild of Sydney improvising musicians Clare Cooper and Clayton Thomas and steadily built a reputation as Australia’s key improvised music event, attracting increasing numbers of local and international musicians and audience members each year. With the founders’ relocation to Berlin last year, the festival’s future might have been in doubt, however the NOW now has always been a community as much as an event, with various members involved in its organisation. This year the three-day festival was run by Jim Denley, Peter Farrar, Monika Brooks, Alex Masso and Dale Gorfinkel. Booked to perform with the Splinter Orchestra, I arrived at the Wentworth Falls School of Arts on the Saturday afternoon in time for the instrument building workshop for kids and found a hall full of children making a joyful cacophony with a huge collection of bizarre devices. Facilitated by mechanical masterminds Rod Cooper, Dale Gorfinkel and Robbie Avenaim, this was no Wiggles concert! Clearly this festival was going to be different. Instead of focusing only on evening concerts, there was a packed program of activities, day and night. Alongside the familiar faces were hippies, parents with children, and the elderly. The local community was curious and keen. Saturday’s events included an all-too-rare appearance by extraordinary vocalist Jo Truman, as well as entertaining interventions by sound poet Emmanuelle Pellegrini on a howling telephone and Brendan Walls in the carpark with his sound art meets Mad Max routine. On Sunday, after a late night of hanging out and listening to experimental jams at the crowded artist-run space Akemi, a former shop in Medlow Bath which served as the festival club, I returned to the School of Arts at midday for Ross Bolleter’s presentation on ruined pianos. While similar in sound to John Cage’s prepared pianos, ruined pianos are in a sense extremely unprepared, in that they have been neglected to the point of disrepair. Bolleter, who had performed the previous night with Jon Rose, provided fascinating insights into these peculiar instruments. He explained how many of them had washed up on the West Australian coast after being discarded from ships, and he demonstrated performance techniques while sitting on the floor, pointing out how the faulty keys, or ‘non workers’, provided important negative space for the music. 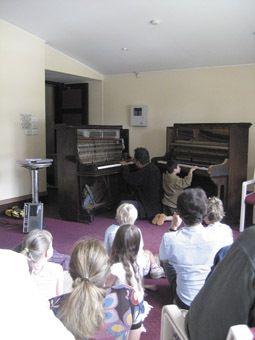 He concluded by inviting children from the audience to join him in playing two ruined pianos. Anthony Magen’s sound walk to Wentworth Falls was squeezed into the program, having been postponed from the previous day due to rain. I tagged along for a while before dropping back to make some recordings of the river and insects, then headed back to the venue in time to see an odd performance by Sam Dobson (double bass), Peter Farrar (saxophone), Alex Masso (percussion), Simon Ferenci (trumpet) and Yusuke Akai (guitar). Commencing with extremely loud bursts of noise that had small children running from the room, the volume control was finally located and the group began to find its way. The players eventually left the room to explore different parts of the building. A ritualistic sound developed, with repetitive drumming and strumming on a single chord augmented by winding saxophone. The performance ended with most of the musicians at the bottom of a stairwell, with the audience watching from above. Next up was the Melbourne duo of Carolyn Connors and Rosalind Hall whose theme seemed to be the use of different materials to modify sound. Hall plays saxophone with custom reeds. Connors, known for her extended vocal techniques, sang with her face pressed against sheets of aluminium foil and plastic wrap, in a manner that was both humorous and disturbing. The duo produced a range of small, breathy, buzzing, yelping and squeaking sounds, while working their way through the selection of objects on the table behind them. After a dinner break, the evening’s music began with Metalog, a new group comprising Amanda Stewart (voice), Jim Denley (flute and sax), Ben Byrne (laptop), Natasha Anderson (recorder and laptop), Dale Gorfinkle (vibraphone) and Robbie Avenaim (percussion). There was some suggestion that the group might be a successor to Machine for Making Sense, but apart from sharing two members (Denley and Stewart) there was little similarity in sound. A better comparison would be the Splinter Orchestra (with which it also shares members) albeit with less complex textures, but greater definition. Beginning with portentous rumbling, the sound from Metalog eventually exploded into electrical hissing and sparks. The musicians moved in shifting combinations and layers, sometimes merging, sometimes distinctive. After nearly an hour of sustained concentration the performance ended with what I can only describe as an ambient techno coda. Overall it was a successful debut, and it will be interesting to see how the group develops. Hopefully there will be a greater role for the usually brilliant Stewart, who was barely audible on this occasion. French performers Mathieu Werchowski (violin) and Xavier Charles (clarinet) stood either side of local laptopper Daniel Whiting for a dense and often melodic set. Whiting’s echoing sample manipulations of strings and voices were well matched by the sliding tones and trills of Werchowski and Charles. After building to a climax the music finished abruptly. Local hero Joyce Hinterding delivered her trademark crackles, buzzes and whines, sourced from the electromagnetic spectrum. Moving her large hoop antennae through the air to find new sounds, Hinterding delicately layered them into a subtle and gorgeous soundscape. Glitching rhythmic loops emerged and finally faded back into the atmosphere. Another local group followed. Ora(ra) consists of Matt Earle (electronics), Adam Sussman (guitar, electronics), Rory Brown (double bass) and Rivka Schembri (cello). Their music was quiet and gently ominous, with throbbing sub bass and cello embellished by microtonal drones. The sounds of the doors opening and closing became audible and interesting. I almost fell asleep, exhausted by the festival so far, but hung on to hear the performance conclude with lovely descending bass tones. There was no question of sleeping through the final act of the festival. Taste of Teeth from Brisbane are like a 1960s/70s freak rock cult—lots of members sporting afros and over-sized sunglasses, men in dresses, and an enthusiastic entourage who dance to anything. The frontman gave a long, rambling introduction as the band prepared behind him, then threw himself across the room repeatedly, doing cartwheels and backflips. The band started up, eventually settling into a propulsive rhythm, with several percussionists pounding away. As I left to catch the last train back to Sydney, I had the feeling that they might keep playing forever.